A scarce and attractive 1661 miniature map of the the Americas by Philipp Cluver. 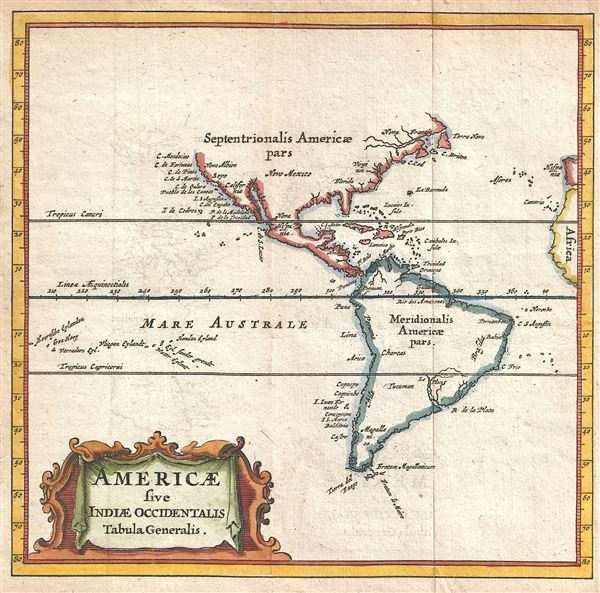 A reduced version of the 1630 De Laet map, Cluver's map presents the Americas according to the geographical conventions of the time. The map offers primarily coastal details. On the east coast, the only place name of note is Cape Cod, although Virginia and Florida are also mentioned. The west coast, by contrast, features numerous coastal sites. This map was issued for the 1661 edition of Cluver's Introductionis in Uniersam Geographiam. Cluver, P., Introductionis in Universam Geographiam tam veterem quam novam Libri VI, (Amsterdam) 1661. Very good. Original fold lines. Some transference. Blank on verso.